Retro Acid was held for the first time 15 years ago in the Vooruit in Ghent. The first editions featured already legendary acid pioneers back then as Mike Dred, Damon Wild, Tim Taylor and Belgian residents Mo & Benoelie. It was the ultimate party for any acid fan and remains that still today. The famous Acid sound that defined and shaped electronic music comes from the Roland TB-303 bass machine. 15 years down the line and it still has a huge impact on the electronic scene. 15 years down the line and the Retro Acid parties are more popular than ever with growing visitors from far beyond the countries borders. The parties feature the whole acid spectrum from the early ‘80’s till the harder ’90’s adaptations and even some of the more recent acid highlights. 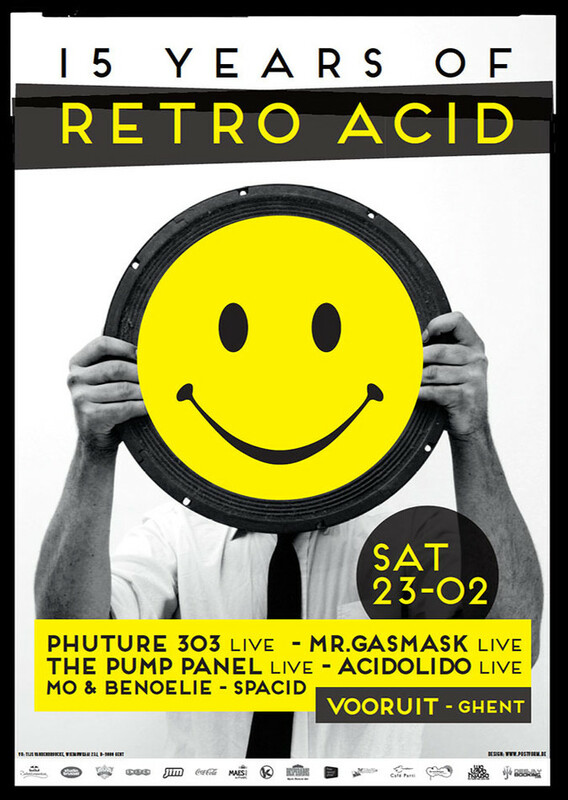 The early ‘80’s will be represented by Phuture 303, generally acknowledged as the first group to ever make Acid. They were the first to use the Roland TB-303, in a way that we now know as acid, in 1987. There would be no Retro Acid without them, maybe not even acid to begin with. So ladies and gentlemen, this is how it started, live on stage! With The Pump Panel Live we welcome back one of our very first guests in the form of Tim Taylor, head honcho of the legendary Missile label. This time he teams up with his partner as The Pump Panel for an exclusive live set. They will be celebrating the re-launch of Missile as Missile Classics and Missile 2.0 around the time of this party. As a live entity Pump Panel have been disbanded for over 10 years but the highly persuasive Kozzmozz team have secured their first live performance in a decade at this Retro Acid 15 Year Anniversary. One of the strongest Belgian live-acts ever on Retro Acid is without a doubt Mr. Gasmask. His sets burst with energy and his outlook on acid is truly original. That’s why we invited him back with pleasure. He just could not be missing on our B-day edition. And also our Dutch neighbors have a strong acid history as proves Acidolido, an Italian duo now living in Amsterdam. They can be found on Narcosis Records and in collaboration with Mr. Gasmak on the first Protocol release. These founders of 00121 records will bring us a hard and aggressive acid set. We are also very happy to feature our first residents ever on the line-up of 15 Years Retro Acid with the now world-famous duo Mo & Benoelie. They know the acid sound well and will be bringing us an acid house set. And the line-up wouldn’t be complete without our current resident Spacid, who was at the forefront of the underground party-scene in the 90’s with Funky Green Aliens and is a true acid pioneer in Belgium since the very beginning. 15 Years Retro Acid, featuring the true inventors and pioneers of the whole acid movement, you know you don’t want to miss this one!